Félix de la Concha | BALAT? Project selected by the first international open-call for artists from Plato Sanat (Spring 2013). This work reveals personal stories within the history of Balat by portraying its inhabitants. Balat is one of the old traditional neighborhoods in Istanbul threatened with gentrification. While listening to residents, it is created an oil portrait and a video interview, which documents the conversation between the painter and his model. This project opens up a micro cosmos, where the spectator gets an intimate and personal insight into everyday life in Balat. The gallery of portraits were accompanied in the exhibition with some street views painted on site in Balat. (These views can be seen in this Website at Here). In the portrait project I did in Istanbul in the spring of 2013 the theme was the urban conflict, the gentrification in the historic district of Balat. The exhibition was titled “BALAT?”. I was selected for this project from an international public call made by Plato Sanat, located also in Balat, offering a residence and exhibition with the theme, precisely, on the urban conflict of this neighborhood. My proposal consisted of portraying and interviewing their residents. And I did so. Meanwhile I painted them, they told me about their neighborhood, about their difficulties, the changes that were taking place, their thoughts and how they felt as all these interventions and urban changes would affect their lives. Thus I ended up portraying and interviewing twenty-one people involved and affected in this conflict. Most of these residents are low-class workers, craftsmen, musicians; the most do not even reach a minimum wage, already low in Turkey. As a counterpoint, two real estate developers participated in my project. They were also involved in this process of transformation and their opinions had also to be taken into account. The social spectrum was not, however, as complete as I had wished. Not because of lack of interest and effort on my part trying to reach other agents, but because not everyone was willing to participate. The point of view from any of the women covered with burkas who pullulate around the neighborhood would have added a valid testimony, but it was unrealistic to hope they would sit for me. More significant was the refusal of the municipality to have a voice representing them, being a fundamental active part in the transformation of the neighborhood. And to have the possibility to respond to the claims against this institution by some of the people portrayed. However the day of the inauguration the municipality sent a splendid bouquet of flowers as a gift with its best wishes. 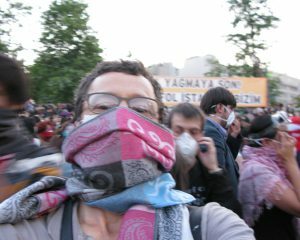 My stay in Istanbul coincided with the Taksim Gezi Park protests. It was an event of political transcendence, not yet resolved. The revolt shook the whole society and was widely spread by the international press. As its origin was also a problem of gentrification, to contest the urban development plan for Taksim Gezi Park, its coincidence with my residency led me to ask my models about their vision of this phenomenon. Which helped to expand my knowledge about their ideas and opinions at other levels and in greater depth. Sometimes came topics that a person on the street is not accustomed to speak out, or on which has not stopped to reflect. For instance, subjects on religion and on homosexuality. There are not usual questions in this regard in a society of Muslim majority and in general very conservative. Although in these sessions I try to arise these topics naturally within a context. Knowing that these issues were being addressed, certain people from the organization that had invited me questioned their relevance and relationship to the urban conflict in Balat. I had to clarify that all these issues and the knowledge of what Balat residents think about politics and religion are fundamental to understanding urban conflict. For example, it is fundamental to know how is the social feeling and opinion on homosexuality. LGBT community has been determinant in the gentrification of certain neighborhoods, like Chueca in Madrid, to give an example. As a complement to these portraits I also went to paint in the streets of Balat. Surrounded by crowds with whom I could not communicate in the same language, this was established through my pictorial activity. This experience was not without incidents. As a malicious child in a vandal act threw my painting to the ground and the painting, with the oil still fresh, impregnated with dust. Although at first I considered this as a catastrophic end to the painting, then it seemed to me that another value had been added to the work. In the exhibition I showed it with that deterioration and adding a card explaining that this work had been done with the help of a spontaneous assistant. In the end it was testimony of a personal experience and expression of another aspect of urban conflict in Balat. From the term “urban” derives “urbanism”, but also “urbanity” to refer to human behavior. A lexical recognition that urban, like art, is an integral part of the human spirit. For the interviews another third person was needed as a translator between my English and Turkish. I want to thank Ecem Ömeroğlu for this and her estimated attention to this project. “Geçmişten Geleceğe Balat” Sergisi Açıldı! BALAT’IN GEÇMİŞİ VE GELECEĞİ PLATO SANAT’IN REZİDANS PROGRAMINDA İZLENİYOR! “İstanbul’daki güncel sanat çevresi için önemli bir mekan olan Plato Sanat, Misafir Sanatçı Programı ile İspanyol sanatçı Felix De La Concha ve genç sanatçı Elif Süsleri ağırlıyor.